A copper pour or fill refers to an area on a printed circuit board where the original copper is not etched away, and remains in place, usually electrically connected to the Ground signal, producing a “Ground Plane”. This has a number of advantages, including decreasing the amount of etching fluid required during manufacturing, as well as reducing the amount of electrical noise and signal crosstalk experienced by the circuit elements. 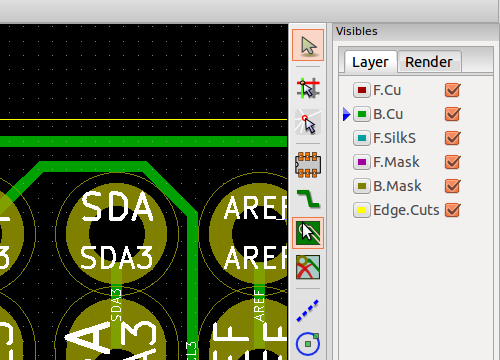 It is relatively easy to create a copper fill in Kicad. We usually add fills after having already drawn in the PCB outline in the Edges layer. First, ensure that you have selected one of the copper layers (such as “Front” or “F.Cu”). Then, select the “Add Filled Zones” from the toolbar on the right side of the screen. 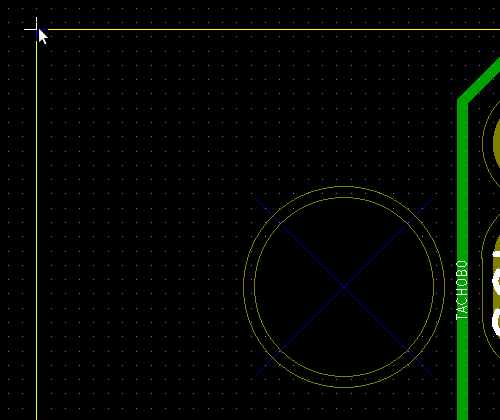 Next, click in one corner of the PCB outline to start drawing the copper fill. Once you have closed the zone properties window, click once in each of the other three corners (in order) on the board outline. Then, to complete the final segment, double-click on the original corner to end the zone. You should see red or green hatching (depending on which copper layer you used) on the edges of your PCB indicating the filled region, as shown in the image below. Generally you want to have a copper fill on both the top and bottom of the PCB. To add the fill on the other side, the easiest way is to right-click on the existing board edge, select “Zone outline”, then go to “Zones”->”Duplicate Zone”. This brings up the zone properties box for the new zone, so select the other copper layer and press “OK”. To see the copper fills in your design, click on the “Show filled areas in zones” button, the 10th button in the left-size toolbar. The button below that will hide the fills. Then, you can run the DRC tool (Ladybug Checkmark in the top toolbar) which will fill all your zones. You should see something like the image below. The brown-yellow color is the combination of red (top side) and green (bottom side) copper fills. We can see the 20 mil clearance between the fill and non-ground copper, and the larger 40 mil clearance between the fill and GND pads. I guess you meant “important”. It’s a hack but it’s the cleanest way of doing this as of now. László, thank you very much for the comment and the compliments, I have updated fixed the “import” into “important”. Glad you liked the tutorial! Mansour, that is a very useful link, thanks for sharing! “First, ensure that you have selected one of the copper layers (such as “Front” or “F.Cu”). Then, select the “Add Filled Zones” from the toolbar on the right side of the screen.”, etc. Also, Text “To add the fill on the other side, the easiest way is to right-click on the board edge,” should read “To add the fill on the other side, the easiest way is to right-click on the EXISTING ZONE edge,”, etc. 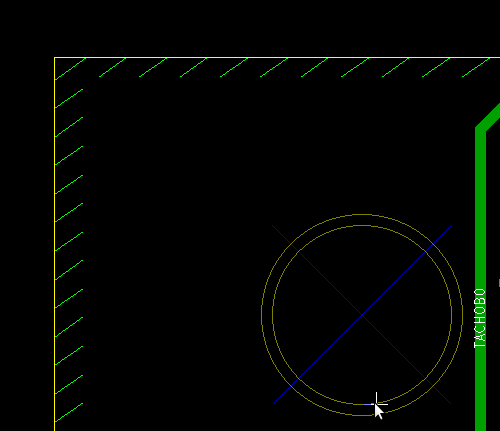 Delete a filled zone with mouse over one of the edge segments and hit Del. 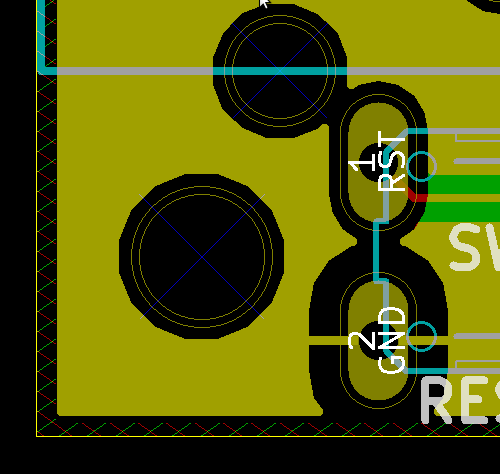 Any way to add restrict zones (like in Eagle) to stop kicad from filling certain areas with copper without having a component there? Hi Giovanni, good question. There is a way to do this. Right-click on the zone outline, then select “Zones” -> “Add Cutout Area”. Now you can use the cursor to define a closed region that will be subtracted from the current zone. You can use this multiple times to create multiple keep-out areas in your fill. Hope that helps! there is something seriously overlooked here. I have multiple nets as a polygon, then when I make a copper pour, it will run straight into another polygon net. this is terrible. can someone explain how this is even possible?